Sparta Senior Center member Ann with her son Jon. When Ann lost her husband of 57 years, she felt like she was all alone. At age 80, Ann found that living on the farm she and her husband had cared during their marriage wasn’t the same without him. She didn’t have a driver’s license, and the challenges of living alone became overwhelming. Her son and daughter-in-law brought Ann to live with them in Sparta. Leaving the farm meant leaving the home she had known for most of her married life, the community in which she had raised her family, and her long-time friends. Ann grew depressed. Some days she didn’t have enough energy to get out of bed. Ann’s son Jon could see that she needed a new reason to get up in the morning. With encouragement and a little push from her son, Ann agreed to meet the coordinator at Sparta Senior Center. 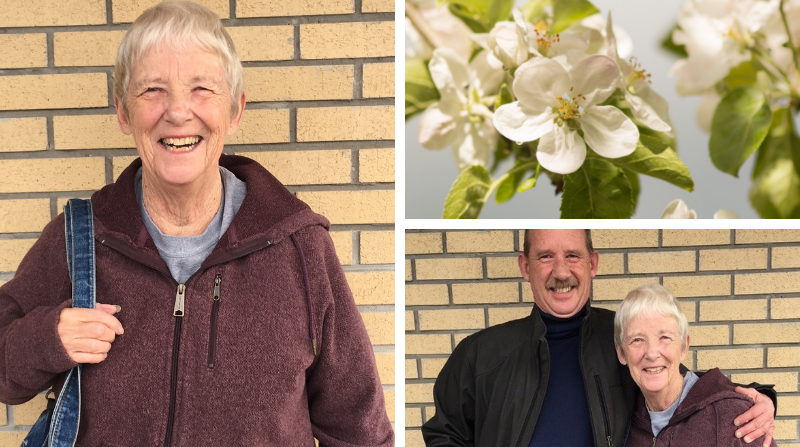 The coordinator persuaded her to become a member, and Ann was assigned a “buddy” to introduce her to the different services and opportunities the center had to offer. The Sparta Senior Center is a program of Senior Neighbors, one of Heart of West Michigan United Way’s partner agencies. Senior Neighbors receives a grant through United Way’s Community Fund, which supports their efforts to ensure that seniors in Kent County are nourished. Learn more about our Community Fund.